Oh Tammy. If you’re going to call someone “trash,” maybe you should start by not talking like trash. Just a thought. The douchebag claimed on a Chinese-language internet forum that a Japanese ninja challenged the Shaolin monks in Henan to a fight and won. The posting last week on the “Iron Blood Bulletin Board Community” described a ninja who challenged the monks of the Shaolin Temple to a fight last month after practising boxing at a Japanese mountain retreat for five years. It claimed the monks accepted the challenge and the ninja won, proving that modern-day monks are trained to perform rather than fight. “The fact that the monks could not defeat a Japanese ninja showed that they were named as kung fu masters in vain,” it said. 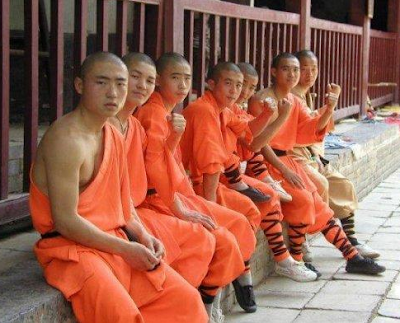 The Shaolin monks responded by hiring a lawyer, demanding an apology, and threatening to sue. The douchebag has since apologized and fessed up that the story was fiction. You can read the apology here, if you read Chinese.